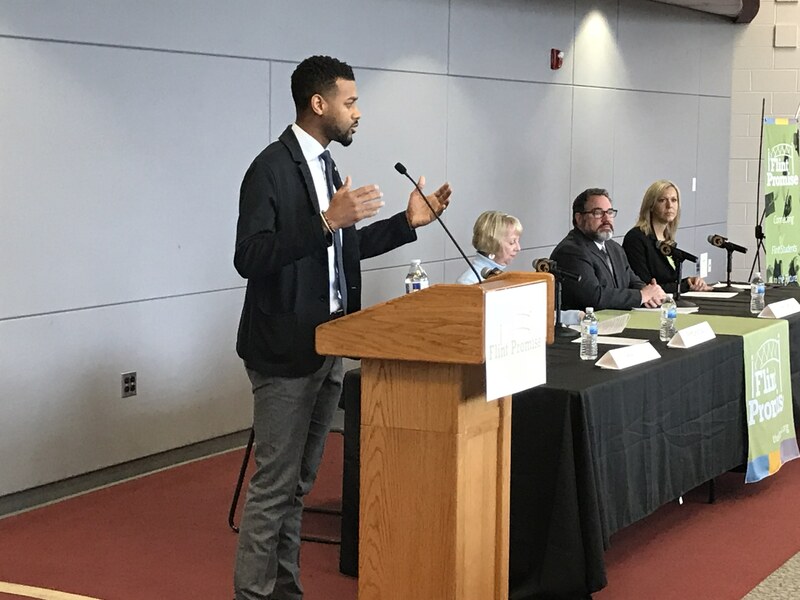 Isaiah Oliver of the Community Foundation or Greater Flint with fellow Flint Promise panelists during a Jan. 27, 2018 informational for parents and students. FLINT, MI — High school seniors in the Class of 2018 can soon apply for the Flint Promise (#flintpromise) scholarship, beginning March 1. 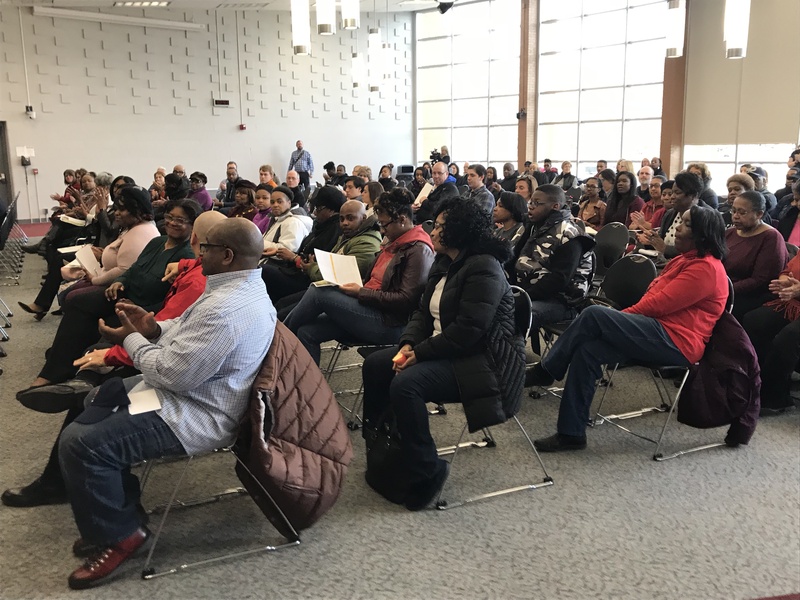 To prepare students and parents for registration, a town hall meeting was held Jan. 27, 2018 highlighting how the new scholarship program will work. The Flint Promise scholarship will be available to eligible students who reside in Flint, and either graduate from a high school or complete a GED program located in Flint in 2018 or later. The number of years a student has lived in and attended school in Flint determines what percentage of college tuition, books and fees will be covered. Flint Promise is a “last-dollar” scholarship, which goes into effect after grants and other scholarships have been applied and will cover up to 100 percent of a student’s costs. Scholarship recipients may attend Mott Community College for up to three academic years as they pursue a certificate or an associate degree. Once a student earns an associate degree or transfer certificate from Mott Community College, he or she is eligible for automatic acceptance to the University of Michigan-Flint. There, the student may extend the Flint Promise scholarship for up to three academic years as he or she pursues a bachelor’s degree. Similar scholarship programs exist in cities including Kalamazoo, Detroit and Lansing, to name a few. Research from the W.E. Upjohn Institute for Employment Research shows that these Promise programs can help strengthen local school districts, increase graduation rates and improve the education levels of the local workforce. In recognition of the new scholarship and the positive impact it will make, the City of Flint today issued a proclamation designating March 1, 2018 Flint Promise Day. Flint Promise was established through $2 million in combined gifts from the Consumers Energy Foundation and Tom Gores, Founder of FlintNOW. Enrollment for the scholarship will begin March 1, with a deadline of July 16 for first-year students enrolling in the fall semester. For more information, including a full list of eligibility requirements, visit theflintpromise.org and download the FAQs.